The CDFC's toddler rooms are designed to support the little explorer within your child. The play focused program is designed for children 18 months to 3 years of age. Toddlers are naturally curious, and our teachers promote this curiosity by providing a safe environment for your child to be themselves. Our toddler room is sectioned into learning areas to encourage different types of play that includes a block area, a dramatic play area, a library, and a manipulations area. Our experienced teachers have an extensive knowledge of child development, allowing them to enhance your child's learning. 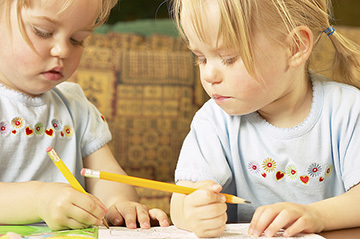 With learning through play, our teachers help your child develop academic skills while playing. Colors, shapes, counting, and sorting are a few skills your child will learn while participating in our toddler room. Art projects are common activities that allow your child to express themselves through different mediums. Teachers sing songs and read books to promote language development. Family pictures and children's art are hung around the rooms to also promote language development. We strive to build your toddler's confidence in themselves and their abilities. Parents receive daily reports about what their child was exploring that day as well as eating, mood and nap times. Call for a tour, you won't be disappointed.